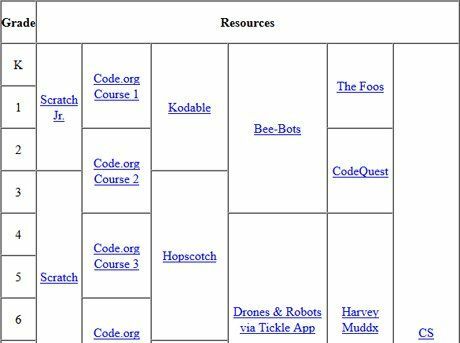 To become a coding teacher, prepare to teach the basics by curating your curriculum, preparing yourself and your classroom, and finding support as needed. Becoming a coding teacher doesn't need to be intimidating. I've tried to convert real programmers into after-school coding teachers and it completely bombed. Trust me -- as a well-trained teacher, you have all of the skills you need to be successful. Plus, it's not like you have to know enough to make the next Facebook, just enough to teach the basics! So let's get started. Note: grade levels are generalized suggestions. Will your students work at their own pace or at your pace? Will students work through a curriculum, or will it be project based? How will students share their work with you, their peers, and the world? How will student accounts be managed? Will you create them? Do you need parent or administrator permission? Just because anyone can learn to code online doesn't mean that's the best way to do it. Code.org's research found that "students who are learning with the support of their teacher in a classroom setting complete courses more than those learning on their own" (Teachers Matter). We all know that for teachers to be successful, we need support. So rally the troops! Find a champion for your coding crusade. The higher level the champion is, the easier it will be for you to gain access to resources and spread the word about your 21st-century class. Get the community involved. Host an Hour of Code community event. Last year, the Avondale Elementary School District held an Hour of Code event where the students taught their parents how to program. Build your PLN. Follow people on your favorite social network and ask for help. Some great hashtags are #CSK8, #KidsCanCode, and #AllKidsCode. Present to your governing board. Show them how your curriculum aligns to CCSS and builds 21st-century skills. Will you know the answer to every question that your students will have? Will you feel well rested, prepared, and in control at all times? Will every class run without a hitch? Answers: 1) No. 2) You wish. 3) In your dreams! Will it be worth it? You better believe it! Now go make it happen!